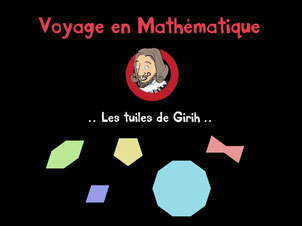 Appli "Les tuiles de Girih"
Relevez le défi et réalisez le plus beau des pavages grâce à cinq polygones : les tuiles de Girih. Étape 1 : Découvrez les tuiles de Girih et la beauté de l’art islamique. Étape 2 : Jouez et manipulez ces tuiles de Girih en réalisant le plus beau des pavages. Étape 3 : Participez au projet en diffusant votre pavage sur vos réseaux sociaux en utilisant le hashtag #girih. Cette application numérique est disponible pour les tablettes APPLE directement en téléchargement gratuit dans l'Apple Store. I have learn a few excellent stuff here. Definitely worth bookmarking for revisiting. I surprise how so much attempt you put to create this type of fantastic informative website. Simply want to say your article is as surprising. The clarity in your post is simply great and i could assume you are an expert on this subject. Fine with your permission let me to grab your RSS feed to keep updated with forthcoming post. Thanks a million and please keep up the rewarding work. I read this post fully on the topic of the comparison of most recent and previous technologies, it's amazing article. I like the helpful info you provide in your articles. I will bookmark your blog and check again here frequently. I am quite sure I'll learn many new stuff right here! Good luck for the next!